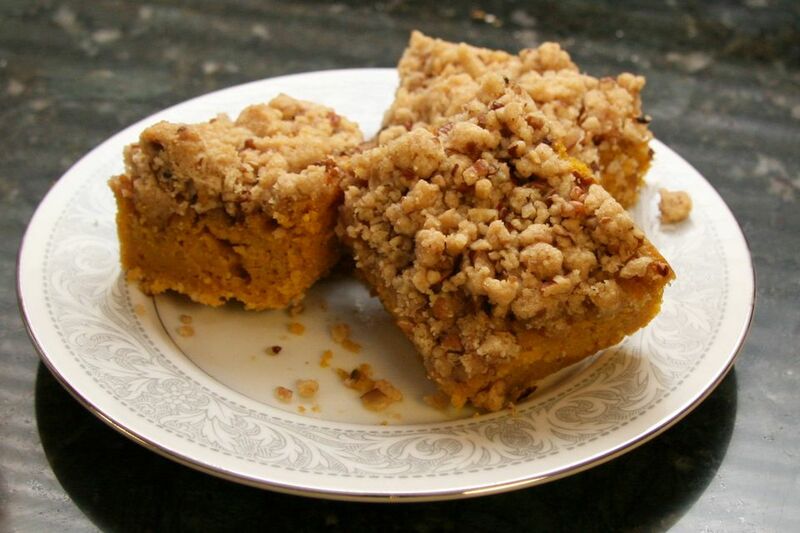 These pumpkin bars are topped with a crumbly brown sugar and pecan streusel topping. The bars are made with brown sugar, spices, and pumpkin puree. The topping is a mixture of brown sugar, pecans, and butter along with some flour and cinnamon. Grease and flour a 13x9-inch baking pan. Heat oven to 350 F.
In a bowl, combine the 1 1/2 cups flour, 3/4 cup brown sugar, and granulated sugar, baking powder, cinnamon, nutmeg, and salt; set aside. In a mixing bowl, beat eggs, pumpkin, vanilla, and oil until well blended, scraping the bowl a few times. Stir in the dry ingredients until blended. Spread in prepared baking pan. In another bowl, combine the 3/4 cup flour, 1/3 cup brown sugar, and cinnamon. Using a pastry blender, cut in the butter until crumbly; mix in the pecans with your fingers. Sprinkle evenly over the pumpkin batter. Bake for 25 to 30 minutes, until set. A toothpick inserted in the center should come out clean. Cool in pan on a rack. Cut in squares to serve.